UCT Coatings, Inc. has applied its metallurgical expertise and breakthrough technology to the marine industry. The result is EXO Marine Shield. This is no typical paint or spray coating that helps for a while but then wears off and has to be reapplied every year. This is a whole new metal surface on the parts that is harder, more wear resistant and dramatically reduces adherence of marine growth. UCT’s broad range of metal coating services benefit the marine industry both above and below the water line. We can coat surfaces throughout the vessel to protect from corrosive salt spray. We can coat engine components to enable them to run cooler, longer, and more smoothly. 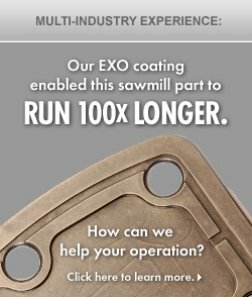 And our proprietary EXO coatings can reduce friction on propeller blades, improving their performance on vessels of all sizes.